My hands say thank you with a clap, clap, clap. My feet say thank you with a tap, tap, tap. And with a bow, I say…thank you, now. I got this craft from a fellow librarian at Confessions of a Real Librarian! The kids had a great time coloring and their moms loved the reminder to cover our mouths! This was a wonderful storytime theme. I loved all of the extension activities and the books — and it really, really showed by how the kids responded to them. The “Thanks A Lot” flannelboard got a lot of parents all misty-eyed and it took me a few listens to not get misty-eyed, myself! The action rhyme I last used in “Sick” storytime was remembered by a few patrons and the kids were more than happy to help me make animal noises. Their favorite book had to be “Oh, No George!” I think they were delighted to be watching George try to be good. Here comes a rock down the hill, boom, boom, boom, boom, CRASH! 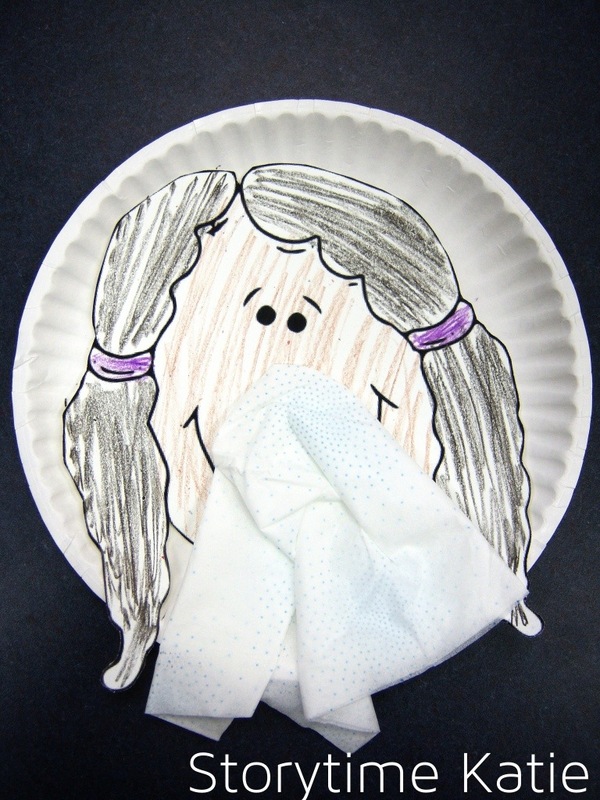 This was a simple paper plate craft that was inspired by Jenna’s post at Ramblings of a Crazy Woman. Since I was doing this with a daycare, I did want to minimize our mess, so I did not do it three-dimensional. The hit of storytime was “Up, Down, and All Around” — they loved this book! Everything else went pretty good, but I was met with a huge reaction of “EWW UNDERWEAR IS GROSS” when I read “Bear In Underwear.” I mean, the kids were in hysterics laughing, but I honestly wonder if they think underwear is gross. The umbrella craft was a huge success and the kids had a great day at storytime! We made tiger masks! I cut these out of paper plates and attached popsicle sticks. I did not bring my example and was so pleased when the kids had purple and pink and green tigers instead of just orange! This was a super awesome storytime. I loved all the books and had a ton of kids who repeated the last word or two as I turned the page. (I adore when that happens and it’s so good for them to practice vocabulary and to build their early literacy skills!) The best book was obviously, “It’s a Tiger!” which is such a natural read-aloud — I really encourage all storytime providers who like to be loud to look into it! This summer, Kids Art is back after a long hiatus! This program is definitely an important one for my community and I’m pleased that we have the space to offer it again. This month, I themed it to space and we painted planets on paper plates. This was a very last minute idea. I had no idea what to do for my craft, because I try to incorporate painting without it being dreadfully messy. Anyway, I figured we could make some planets since it would be a very easy contained craft by limiting the art space to a paper plate. “Space Boy” was the favorite book, and each kid got to make three planets before it was time to call it quits. First, we painted and then we did the books to give their planets some time to dry before going home. Overall, it was a very successful program and we’ve had very positive feedback from parents via our Facebook page! Did you ever see a penguin swim this way and that? Swim this way and that way, swim this way and that way? This was the same craft that I made for pizza storytime. I just saved all the left-over yarn for this storytime. The kids were particularly impressed by the two books that had multiple P words in the titles. And I think that “Polly’s Pink Pajamas” was the overall favorite; mostly because it inspired a chaotic conversation about what color was best for pajamas. Our big extension activity hits were definitely the flannelboards and the rhyme “Pizza Man.” Their pizza crafts were very creative — I had a lot of kids who made rainbow pizzas! If you want to eat some pizza, clap your hands! This was a craft from KidsSoup, and it was very simple! I could have cut out tons of toppings, but I find most kids just prefer cheese at this age.